You never get a second chance to make a first impression, and what a better way to make a first impression than with a beef jerky business card. It’s unique, delicious, and it shows your sense of humor. Made from carbon dioxide, a laser, and some beef jerky. 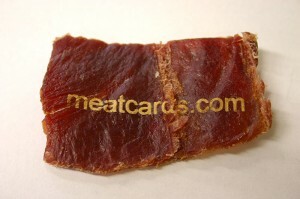 Meat Cards were designed to make an impression. Who says you can’t mix business with pleasure? No need to worry either, these beef jerky business cards are totally edible (just not to the USDA I think)…the company says it best when they say “they are only made of two ingredients, “meat and lasers.” Yummy! It doesn’t stop there though according to the folks over at Meat Cards, they are supposedly in the lab thinking of other foods in which to apply this to. Any suggestions?? Enter now to WIN FREE JERKY!! !